Chartier is a rustic, Quebec French style restaurant in the heart of Beaumont, Alberta. For those who have dined at Chartier, named one of the top 30 new restaurants in Canada by EnRoute Magazine last year, you can feel the warmth and love in every dish that chef Steve Brochu and his culinary team plate on the restaurant’s collection of vintage plates. Last week, Chartier played host to the latest Taste Alberta dinner in the Prairie on the Plate dining series. Chef Brochu’s four-course meal for $75 highlighting some of Taste Alberta’s commodity partners: Alberta Canola, Egg Farmers of Alberta, Alberta Milk, Alberta Pulse Growers, Alberta Turkey Producers, and Alberta Pork. Guests were greeted by the Chartier team with welcome drink – an Alberta Premium Rye Saskatoon berry shrub lavender syrup and soda. Alberta Premium Rye, Saskatoon berry shrub lavender syrup & soda. With the clanging of a pot to grab our attention, chef Brochu welcomed us all and explained our first dish of the night. In advance of the event, Debra with Alberta Pulse Producers had dropped off some products from Alberta farmers to inspire chef Brochu. With a black box of pulses, Chef Brochu used green pea flour to make a house-made sourdough. He topped the bread with a fibre-packed serving of marinated black, red, northern grey, pinto beans and pine nuts, alongside parsnip chips. Green pea flour sourdough topped with marinated black, red, northern grey, and pinto beans, toasted pine nuts, and parsnip chips. For our next course, chef Brochu showed Alberta Turkey Producers some love by creating a smoked turkey mortadella. Smoked turkey mortadella topped with flourless blue cheese cake, gremolata and roasted pink oyster mushrooms from Gruger Family Fungi. Morinville Colony turkeys were transformed into a mortadella (I’m sure Chartier could sell by the slice at their bread window), topped with a flourless blue cheese cake, gremolata and roasted pink oyster mushrooms from Gruger Family Fungi. For our main course, chef Brochu showed that pork belly can be the star of the show, and not just reserved for appetizers. 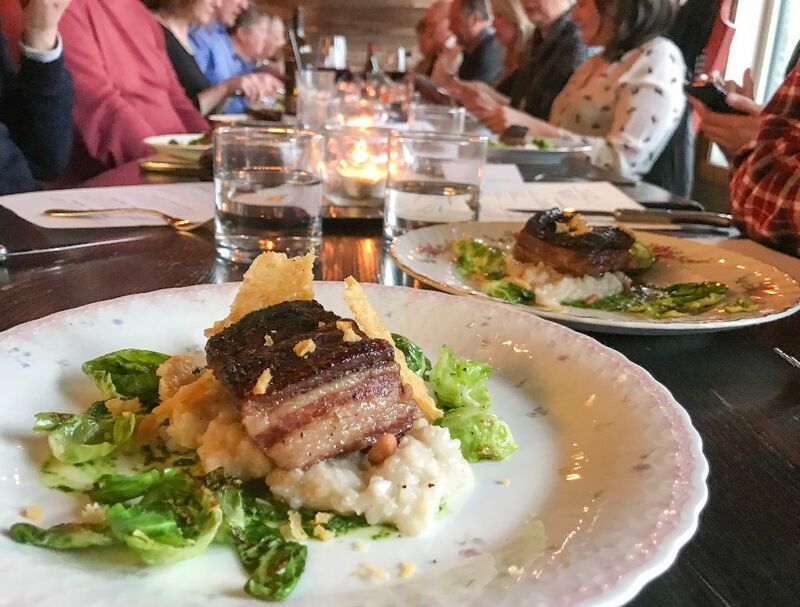 Chef Brochu shared a roasted Bear and the Flower Farm pork belly served with a pine nut risotto, parsley puree, parmesan crisps, and Brussels sprout leaves. For all you pork belly fans out there – this was a crispy skinned and flavourful winner. For dessert, chef Brochu found inspiration in an olive oil cake popular in both Spain and Italy. But, for a true taste of Alberta, chef created a roasted lemon cold-pressed canola cake topped with Revolution Ice Cream Co. lavender ice cream and dried strawberries. (Obviously, my boyfriend The Spaniard approved). One of the things I love about dining at Charter, particularly for brunch, is the variety of gluten-free options for celiacs like myself. Chef Brochu spent the evening accommodating diners with allergies from gluten to nuts, so I knew I would have something special coming for dessert. Knowing that I am a bit of crème brûlée fan, chef Brochu served me a double chocolate crème brûlée. Served on a vintage sauce, it was almost too cute to eat. Almost. (I cleaned that ramekin right out). After we had a chance to thank chef Brochu, the entire culinary team, and all the lovely front of house ladies, a few of us took advantage of the restaurant props to snap a few Game of Thrones inspired photos. A huge thanks to chef Brochu and the entire Chartier team for hosting Prairie on the Plate, and for highlighting just how amazing Alberta ingredients are. I’m doing my best to introduce more pulses into my cooking – I would be far more likely to eat my beans if I had chef Brochu at my disposal to plate as beautifully as he did that evening.